Why did you become a dentist of all things? I was a very goofy teenager becoming more and more conscious that my teeth arrived before the rest of me! Luckily I was at school in Bedford and a number of my classmates were the sons of dentists. Mr Kettler, who at the time was President of the British Orthodontic Society, had a very successful practice just outside the school gates (yes we were locked in), and had in no time fixed me up in headgear and wires not dissimilar to young Willy Wonker! What was it like studying at Guys Hospital in London? Tough. Fluoridation of the water supply was expected to reduce the number of dentists required and the Government closed several dental schools the year I applied. Competition was fierce for places but thank fully I got the grades! It was amazing studying under the leaders of the profession. Guys has always been Europe’s most prestigious dental school Its research is rated 5 stars in every department. Cambridge and Oxford don’t teach dentistry as dental schools have always been sited in centres of large populations – Guys serving The City, South London and the whole of South East England. I spent a year with Professor Poswillo and Mr Bret Day working as House Surgeon in the Oral Surgery department. At 22years I was the possibly the youngest qualified dentist in the UK. I was a little homesick and tired of study so I returned home to Bedfordshire and completed a year of Vocational Training in a NHS practice in Biggleswade. I was shocked – too many patients, too little time, while the boss drove around in a new car cracking the whip ! Luckily I was offered a position in a private practice run by Robert Tutton in Royston near Cambridge. This was a brilliant move for me. Robert was so thoughtful and cared so well for his patients. 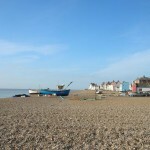 He gave me time to develop my skills and when I was ready helped me find the right practice of my own, knowing Aldeburgh to be the perfect place. The Dental Practice sales agent was London based. He tried to convince me to buy a London practice and suggested there would be nothing to do in Aldeburgh during the winter. I thought great I can go skiing!. How wrong he was. I arrived in July 1997and by December the practice was bursting at the seams! Who’s had the biggest influence on your professional career to date ? Apart from the afore mentioned definately my former associate Dr Colm O’Loglen. He joined me in 2002 after we met on a dental implant course and stayed five years. Things somehow clicked and we are still close friends to this day sharing tips on an almost weekly basis! He left to takeover his father’s practice in County Kerry, without doubt he’s become one of Ireland’s most able and respected practitioners. I always had a soft spot for Framlingham. The castle, the great schools and the more relaxed rural atmosphere. The population is obviously much younger and vibrant. That’s what happens when schools work well and are able to bring the very best out of young people. We’re continuing to develop a great family practice. I believe the practice has already become a very valued community asset. What have been the highs ? Happy, well cared for patients supported by enthusiastic staff who love dentistry. Continued Government support that allows us to offer exceptional NHS dental care to children and young adults. The fantastic support within the dental profession that I believe is totally committed to doing the best for the Nation’s teeth. The BDA are a fantastic organisation and are now working with the Care Quality Commission (CQC) to ensure that dental treatment within the UK is probably the safest worldwide – well done folks! It seems you sometimes have to take a step backwards before you move further forward. Managing building projects whilst having to keep the practice running and looking after patients. Great nurses stopping to have a family. Finding good replacements for well liked associate dentists leaving to start their own dream practices. Running a business alongside your professional responsibility to your patients – I truly wish we could do it all for free. Trying to do quality dentistry on demanding mature patients within the current restrictive NHS dental contract – good dentistry needs time and investment. Constantly updating my skills to ensure that we are able to offer my patients the very best and trusted treatment options. The practice has made huge investment in the very latest digital low dose x ray technology. We believe we are the only practice in Suffolk with a CBCT 3D scanner necessary for the safest, most predictable placement of dental implants. This allows us to create a 3 dimensional computer image of the patients jaws so we can calculate and place implants safely without damaging vital structures otherwise hidden from view. Time spent relaxing with Cheryl, our young family and two crazy Jack Russells. And of course regular trips to Bad Gastein Salzburg in the Austrian alps. Where do you see the profession in 15 years time? Its a great time to be involved in the dental profession. Its even better being a patient. Super anaesthetics, modern equipment with happy caring staff make a visit to the dentist so much better now than ever before. Dentistry is literally on everyone’s lips. Its seems every time you turn on the TV dentistry and its marvels are being talked about. New techniques are giving people the smiles they dreamed of and making the daily life of dentists fascinating. The dental industry is booming with Smile makeovers and complex procedures being carried out in quality private practices through out Britain and not just expensive fashionable London clinics. The days of wearing loose dentures or having unsightly teeth are behind us. Modern crowns, bridges, veneers, implants and whitening techniques are making treatment planning options remarkable. Patients now have the choice to live with a great smile forever. The profession is attracting the most talented youngsters of the next generation. Its remarkable how many children of dentists go on to join their parents. Its also quite interesting that many regular medical practitioner’s are now encouraging their own children to look into a dental career instead of medicine. In August we have the son of a long line of Bavarian doctors joining us for a weeks work experience all the way from Germany. The future certainly looks very bright indeed.